These swanky motorcycles let you munch miles without costing a bomb! Bajaj is well-known for pricing its products competitively, and the brand’s baby cruiser, the Avenger 180, is currently the most affordable one in the country at Rs 96,922 (ex-showroom, Delhi). The bike features a quintessential cruiser design with raked-out forks, low seat and a meaty rear tyre. Bajaj introduced this cruiser last year, replacing the smaller Avenger 150. The Avenger 180 employs a Pulsar 180-derived 180cc air-cooled engine, churning out 15.5PS at 8500rpm and 13.7Nm at 6500rpm. It works along with a 5-speed transmission. If you want a bit more power, Bajaj offers the Avenger 220, starting at Rs 96,922 (ex-showroom Delhi). This one comes in two variants: Street and Cruise. The former packs Street Control handlebars offering a slightly forward-biased stance, small grab rail and alloy wheels with tubeless tyres. On the other hand, the latter comes with a Highway Comfort handlebar which offers a bit more laidback ergonomics, a cushioned backrest and spoke wheels with tubed tyres. It draws power from a 220cc air-and-oil-cooled engine which produces 19.03PS at 8400rpm and 17.5Nm at 7000rpm. The Intruder is Suzuki’s first cruiser in the Indian market. Suzuki designed this motorcycle taking inspiration from the legendary Intruder M1800R power cruiser. Though it doesn’t fall into the traditional cruiser category, the Intruder 150 is, in fact, a modern take of the cruiser platform. While we reserve our comments on how the bike looks, it is a surprisingly sound motorcycle when it comes to dynamics. The Intruder 150 packs a Gixxer-derived air-cooled 154.9cc single-cylinder motor, which generates 14.8PS at 8000rpm and 14Nm at 6000rpm. You also get a fuel-injected version for almost Rs 7000 more. Interestingly, the output figures are the same, but the FI variant enjoys a smoother throttle response and offers around 3kmpl more (both city and highway) mileage than the carb variant. Speaking of numbers, the FI version returned 50kmpl in city and 57.8kmpl on the highway in our tests. Currently, UM bears the distinction of being the only brand in the affordable cruiser segment to offer bikes with a liquid-cooled engine. Its entry-level cruiser, the Renegade Sports S, costs Rs 1.82 lakh (ex-Delhi) for the carb version. Interestingly, the FI version also costs the same. The Sports S is more of an urban cruiser, complete with alloy wheels and bikini fairing. If you want a proper traditionally-designed mile-muncher, go for the Renegade Commando. It comes with blacked-out spoke wheels, old school Fat Boy-ish round headlamp, cushioned backrest and the likes. 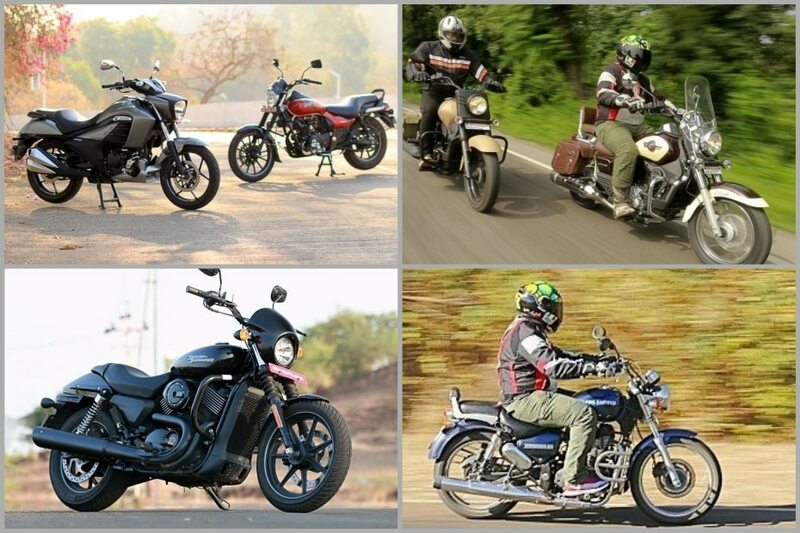 The Commando will set you back by Rs 1.82 lakh (ex-Delhi) for both the FI and carb version. The Thunderbird range has been one of the most popular choices for touring enthusiasts for quite a long time now. Though the platform is shared with the Classic range, the Thunderbird is more practical and feature-laden than the Classic. You get a humongous 20-litre fuel tank, digital-analogue combo cluster and very laidback ergonomics which instill the confidence to ride longer. However, the suspension is on the stiffer side compared to the Classic. The Thunderbird 350’s 28Nm mill feels most relaxed when cruising at around 80kmph. If you’re into torquey bikes, the Thunderbird 500’s 41.3Nm motor will keep you happy. The 350cc variant is priced at Rs 1.54 lakh while the 500cc model will set you back by Rs 2.05 lakh (both ex-showroom, Delhi). We all know this list wouldn’t be complete without a Harley-Davidson. The Street 750 is Harley’s take on a streetbike and is the American motorcycle brand’s most affordable product. At Rs 5.33 lakh (ex-Delhi), the Street 750 isn’t exactly cheap but opens up a relatively pocket-friendly avenue for many aspiring Harley customers. Though it's the brand’s entry-level product, Harley hasn’t cheaped out in any way. It gets a proper 749cc liquid-cooled V-twin Revolution-X engine producing a healthy 59Nm of twist at just 3750rpm. A dual-channel ABS is standard too, acting on disc brakes at both ends. Even though it weighs 233kg kerb - making it the heaviest motorcycle in this list - the Street 750 is pretty manoeuvrable in the city thanks to its low 720mm seat. However, out-and-out long-distance riding is limited due to the 13.1-litre fuel tank.